If the experts are correct we are supposed to be living in the post Cold War era. You wouldn’t know it from looking at the US debate about Chinese nuclear weapons. On September 25 Georgetown University Professor Phillip A. Karber told a gaggle of US China-watchers that the US may be dramatically underestimating the size of China’s nuclear arsenal. He is not the only one to make such claims. 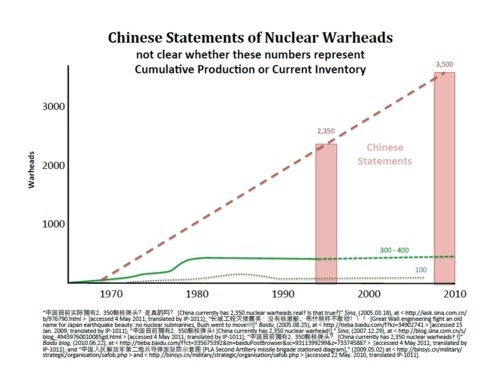 After taking his audience on an impressive internet photo tour of “China’s Underground Great Wall,” the professor showed a slide (below) indicating there were “Chinese statements” claiming China possessed 3,500 nuclear warheads. It matters little that none of the Chinese sources cited at the bottom of the slide back that up. In Washington these days, the charge speaks louder than the facts. Most US intelligence estimates put the number well below 1,000. UCS estimates that China manufactured between 200 and 300 warheads and may have enough military plutonium stocks to make another several hundred. Karber’s sources are personal blog entries plucked off the Chinese internet with keyword searches. 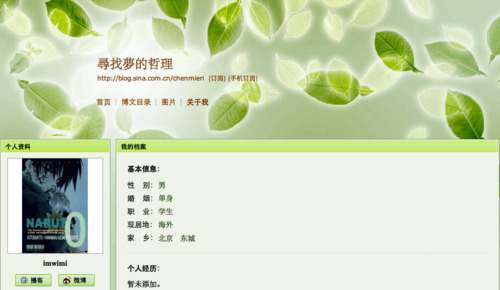 The most detailed “citation”, which asks readers if the number could really be 2,350, but does not make such a claim, is a personal blog post written in 2007 by a Chinese study abroad student whose on-line persona is “chenmieri”. Here is a picture of the young man’s “about me” page. That this kind of chicanery passes for scholarship is lamentable. But the real tragedy is that the seemingly endless propagation of this type of misinformation is sustained by the continuing lack of progress in official and semi-official nuclear dialogues between China and the United States. In the absence of more credible information and discussion, nonsense fills the void. I recently wrote an analysis of the U.S. – China nuclear dialog for Arms Control Today based on an extensive examination of a 400-page classified military textbook used to train the officers and soldiers of China’s Second Artillery – the branch of the Chinese military that operates China’s land-based nuclear weapons. The text has been circulating in the US intelligence community for several years. The contents of the text confirm information about China’s nuclear arsenal collected by US national technical means. That information indicates China maintains a small nuclear force that is kept off alert. The classified Chinese textbook, written not for foreign audiences but for China’s nuclear missiliers, also stresses the importance of Chinese declaratory policy, which states, unequivocally, that China’s nuclear weapons are to be used only in retaliation after China suffers a nuclear attack. US participants in the dialogues are trying to force their Chinese counterparts to stop talking about China’s no first use assurance, and to stop pressing the United States to offer a similar assurance to China. The US military and diplomatic establishment does not find such an assurance credible, or believe it contributes to stability. But the Chinese disagree. As a result, the talks have been deadlocked for over a decade, leaving the public discussion open for the wild and unfounded speculations of people like Karber. Instead of engaging the Chinese on their quest for a US no first use assurance, or attempting to understand why China believes these assurances contribute to stability, Obama administration officials responsible for the talks are now trying to force the Chinese to send different people to the table. The US wants to talk with the senior leadership of the Second Artillery, which operates China’s land-based nuclear missiles. There is a widespread and long-standing US belief that Second Artillery leaders may think more like Americans on the question of no first use. But the Second Artillery text demonstrates that there is no disagreement within China over the importance of no first use, and that the Second Artillery indoctrinates its missiliers to honor and respect the no first use policy. The Cold War is over. China need not become an obstacle to the deep reductions in the nuclear arsenals of Russia and the United States promised by President Obama in Prague at the beginning of his term. It is time we started speaking seriously with China about how to realize those promises while maintaining strategic stability, instead of arguing about who China sends to the table.